« Ice Caves on Mars! Well, I’ve been a bad space blogger, and didn’t write anything about the spectacular successful launch of SpaceX Falcon 9 rocket on June 4th. Considering the ongoing wailing and gnashing of teeth over the cancellation of Constellation in favor of using commercial rockets to send astronauts to the ISS, I thought it would be worth taking a look at how Falcon 9 compares with the Ares 1-X, which launched back in October. Both rockets were launched as test flights, and the final design of both was meant to send astronauts and small amounts of cargo to and from the space station. Ares 1-X was a suborbital test flight, using the same solid rocket booster that the finished Ares 1 would have used, but with the fifth segment of the booster, the second stage, the crew module and the escape tower as mass simulators rather than the actual components which were not ready at the time of launch. Ares 1-X also borrowed its avionics package from a commercial Atlas V rocket. Falcon 9 was an orbital flight, using a completed launch vehicle but a Dragon mass simulator “qualification unit” (see comment below). The Ares 1-X rocket reached an altitude of 46 kilometers and traveled about 240 km downrange. When the upper stage simulator separated from the booster, it began to tumble. The real Ares 1 would have had boosters on the upper stage that might have been able to correct for the spin. One of the three parachutes on the Ares1-X booster failed, causing the booster to crash into the ocean harder than expected. Falcon 9 launched successfully and reached its expected 250 km low Earth orbit. The spacecraft rolled more than expected late in the flight, and the theoretically reusable first stage broke up in the atmosphere, due to parachute failure. The final Ares 1 would have been able to launch a payload of 25,400 kg into low Earth orbit. 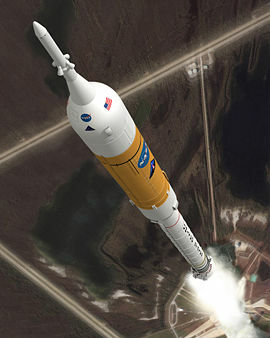 The constellation program called for the development of a heavy-lift vehicle, the Ares V, but no prototypes of that rocket have been built or tested. With the impending cancellation of Constellation, there are no more Ares test flights scheduled. Falcon 9 can launch 10,450 kg into low Earth orbit, and a Falcon 9 “Heavy” variant, which would use two additional first stages as side-mounted boosters, would be able to lift 32,000 kg to LEO. The heavy variant has not been tested. A second Falcon 9 test flight, with a fully operational Dragon capsule is slated for later this summer. The Ares 1-X project cost a total of ~$445 million, and the Augustine commission found that it would likely cost $5 to $6 billion to develop the final Ares 1 rocket. They predicted a recurring cost of about $1 billion per flight of the Ares 1/Orion launcher and spacecraft. For less than the cost of the Ares I mobile service tower, SpaceX has developed all the flight hardware for the Falcon 9 orbital rocket, Dragon spacecraft, as well as three launch sites. Per-launch cost for the Falcon 9 is predicted to be around $50 million for the normal booster and $78 million for the Falcon 9 Heavy. 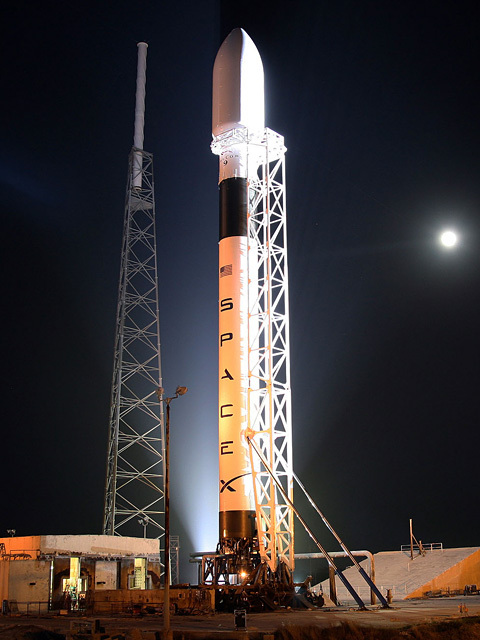 So what does the successful Falcon 9 launch mean for the future of spaceflight? It’s too early to really tell, but SpaceX had a major victory with its successful launch. Falcon 9 is a fully operational vehicle that had a nearly flawless test flight. Later this summer, we will hopefully see a second successful launch, including an operational Dragon capsule. And I don’t know about you, but my jaw just about hit the floor when I saw the cost of Ares 1 alongside the cost for Falcon 9. To put it in perspective, if the Augustine commission estimate of $1 billion per Ares 1 flight is correct, and if the SpaceX estimates for the Falcon 9 launch costs are correct, you could launch about twenty Falcon 9’s or twelve Falcon 9 heavies for the same price as one Ares 1 launch. Converting that to payload to orbit, $1 billion could get you 209,000 kg to LEO using Falcon 9’s, 410,000 kg using Falcon 9 heavies, or 25,400 kg on the Ares 1. This entry was posted on June 12, 2010 at 1:25 am and is filed under Humans in Space, NASA, space policy. You can subscribe via RSS 2.0 feed to this post's comments. Both comments and pings are currently closed. Two small corrections for you, Ryan: the Falcon 9 launched with a Dragon “qualification unit,” which is a bit more than a mass simulator. It returns more engineering data for analysis, and may have some limited capabilities on its own, rather than just being a chunk of mass the right shape and size to match a Dragon capsule. *cough* yes, that’s $445 million. Not $445. And I changed the wording for the qualification unit and directed readers to your comment. Thanks for the corrections! Thanks for the excellent side-by-side comparison. In particular, thanks for focusing on the outcomes and capabilities of the two launch systems, rather than the technical details of the technology. The technical details are important, of course, but too often the choice between one system and another comes down to a debate over technical direction rather than an apples-to-apples comparison. Comparing the outcomes of these two development programs to their cost, the choice is a bit more obvious. First time visitor here. Great site! I appreciate it. Your article shows what can happen when NASA’s money incentivizes commercial companies in a COTS-like approach. Now, imagine if we extend this concept to the development of cis-lunar space. Have NASA allocate about 20% of its budget each year to commercial incentives for milestones achieved. Could commercial companies establish LEO fuel depots, satellite servicing, space tugs, earth departure stage, medium-sized lunar landers, teleoperated robotics, ISRU, and finally, bringing lunar water ice back to LEO. Each of these areas represent a potential commercial market. So NASA primes the pump, pays for services based on those capabilities and then the commercial companies are in a position to provide those services to the commercial market making them sustainable. I calculated that a single Falcon 9 Heavy could lift the entire upper Apollo stack if it were launched from the Earth’s surface unfueled. If the EDS and landers could be fueled by lunar water in LEO (after such capability were established) then we could carry on an Apollo program at SpaceX prices. I’m not sure I understand what the commercial incentive for all of the things that you discuss would be. Companies are not going to do anything unless they’re likely to make money. The best prospect I know of for making space profitable is space-based solar power, but if you know of something else, I’m all ears. Cool thought regarding launching an Apollo-like upper stack on a Falcon 9 heavy. I suspect there might be issues with the stability of the rocket in launching a big empty (unfueled) shell like that, but it would be worth looking into. I’m not as optimistic about lunar H2O as a resource, but if orbital fuel depots could be made cost-effective that may not be an issue. One BIG problem with the cost comparison between the Falcon 9 and the Ares 1 is that according to Mr. Elon his cost estimates take into account that his Falcon first stage vehicles are to be reusable. He has yet on any flight shown the Falcon 1 or the Falcon 9 to be reusable. Even with the so called successful test flight he still won’t be able to prove reusability since the first stage broke up on its way back down. The only so called reusable engine in existance is the SSME even though with the standards of space hardware today the engine is completely torn down after every flight and rebuilt, turbopumps and all. Mr. Elon has yet to meet any standards and has yet to feel the wrath of a devastating failure where human life is lost. Only then will people wake up and realize why government space hardware cost so much. If it wasn’t for the thousand checks and balances, all put into place because of a mistake or a process that fell through the cracks decades ago, space flight would be cheap, but also a terrifying ride never knowing when one will fail. I visited SpaceX a couple of years ago during the building stages of the Falcon 1 and after what I saw I can’t believe anyone thinks they meet the same safety standards that NASA is currently forced to follow. The vehicle assembly area was literally spitting distance from the manufacturing floor kitchen where sodas and food are stored. The engine assembly was in the same area blocked by several sheets of hanging plastic. I have also been to Northrop, Rocketdyne, and NASA facilities where similar areas of course exist, but are strictly controlled by locked areas, sign in sheets, and security checks. Also the procedures to even get into those areas require cleaning and proper protective clothing (that is clothes to protect the hardware) none of which I saw once at SpaceX’s facility. I was free to walk just about anywhere I wanted to see with no checks or proper protective gear. Once SpaceX is forced to follow the same standards NASA has been forced into by the American public caused by decades of experience, success and of course failure, only then will everyone wake up and truly know the truth behind the comparsion they are making. I find it quite ironic that people are claiming that SpaceX’s factory floor practice and haste in rushing unmanned technology demonstrators (and mind you, this was a few years ago, when they were learning their lessons by putting Falcons in the drink) to the launch pad is somehow more dangerous than the remarkably poor decision to create a booster to launch crewed spacecraft from the same solid rocket motors that were directly responsible for one shuttle disaster and–one could argue–indirectly responsible for shaking loose the insulation which caused the second. Not even the Russians or Chinese are crazy enough to create a manned booster from a dangerous and literally uncontrollable solid rocket motor, and only Rutan’s company is nuts enough to put people on a spacecraft with a hybrid motor; the next worse thing. SpaceX likely does have serious quality control issues in dire need of fixing, but the Ares program was simply systematic insanity right from its very start. No matter how many bunny suits you make your assembly people wear, or how FOD-free your workplace, putting men atop a SRM is simply a bad idea. Just because people were so desperate for ANY manned space access system that they were willing to hold their noses and pray that ATK’s monstrously powerful Washington lobby wouldn’t leave us with more exploding launch vehicles doesn’t mean that we live in a universe with a deity who listens to such fanciful requests. Similar the new practice of contracting out microgravity parabolas with less-skilled industry 727 pilots at (lower quality and) double the cost of those flown by the more-experienced, higher-skill crew of NASA’s KC-135a (they now fly half as many missions per year so the program costs haven’t gone up), NASA has a serious lobbyist problem at all levels, and the Ares-I was a shining example of detail success but system failure. Without working on either system, myself, I can’t say whether the Falcon 9 is any safer than the Ares-I, but the basic principle is certainly more sound. The Falcon rockets are likely to run into fixable quality control issues, and implementing industry best practice at their manufacturing facility probably isn’t going to drive the per-launch cost up by two-thousand percent. The Ares-I on the other hand, was simply a losing proposition from the get-go, and its cancellation was the best thing to happen to the US space program in quite some time. The ARES 1-X did not use the same rocket motor that the ARES will use. ARES 1-X used a Space Shuttle 4 segment solid rocket motor with a 5th “dummy” segment for a mass simulator. The trajectory and velocities were no where near what the actual ARES rocket was to achieve. I believe it is in error to compare the so-called cost of the Falcon development costs against the ARES development costs. Although I would concede that ARES was overbudget and not progressing as hoped, costs for development of the Falcon 1, Falcon 9, Falcon 9 Heavy Lift (27 engines!) and the Dragon are actually subsidized by NASA funding for launch and fabrication facilities at KSC, as well as unkown subsidies that will end up at SpaceX for further Dragon development. Dragon is not developed or man-rated yet. SpaceX had a hard enough time recognizing they needed to comply with range safety systems. One has to wonder what other standards, laws, requirements, and interfaces they are ignoring for the future vehicles. I agree with the comment that SpaceX hasn’t had the opportunity of experiencing a failure with loss of human life. In the end though, NASA is responsible for the safety of astronauts, and will be responsible for any mishaps regardless of vendor or acquisition strategy. What is disheartening is the degradation and loss of propulsion technology expertise at NASA. Inevitable in the current plans, but not on the presidential radar screen. If you examine the videos carefully, you will see that small thrusters fired on the Ares I-X simulated upper stage, intentionally placing it into a tumble. This is so that aerodynamic drag would slow it as it fell to the ocean, rather than allowing it to continue on its trajectory like a hypersonic dart soaring toward Europe. The statement, “The real Ares 1 would have had boosters on the upper stage that might have been able to correct for the spin,” is erroneous on two counts. The stage was not in a “spin,” and this motion, intentionally induced in the simulated stage, would not have even occurred on the upper stage. Any slight deviation of trajectory would easily have been corrected by the J2X engine which fully gimbles. Ares1 was simply a horrible idea designed to preserve Shuttle worker jobs and a major step backwards. It is a bad idea to use solid rocket fuel with human transport. Ares1 has to be a heavy lift rocket because the massive escape system required to pull away from a solid rocket explosion has to be monumental. Anything Ares1 could do, Falcon9 can do safer and a fraction of the cost. have a commercial/customer account with SpaceX?